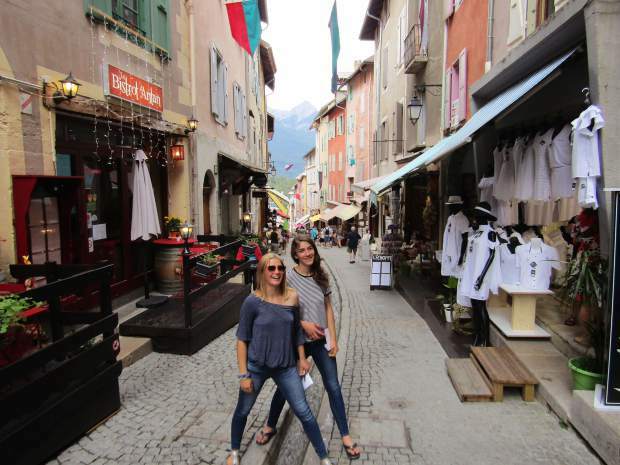 While training and studying abroad this summer, Vail Ski & Snowboard Academy student athletes visited Briancon, a medieval town located in southeastern France. Editor’s note: Reece Bell, 16, is an incoming senior at Vail Ski & Snowboard Academy and is a second-year member of the U21 British Ski Team. She is training and racing around the globe this summer, blogging along the way. After four days of free skiing at Les Deux Alpes, a ski resort in France, we began a four-day giant slalom training block. A lot of the athletes at the camp are in their first year of International Ski Federation racing, which means they have to move to a larger ski radius. Often this is a difficult transition, so the coaches included brushies in our course to ensure that we skied the correct line. The conditions were a little more variable, ranging from rock hard surfaces to softer rutted ones, but as our head coach reminded us, difficult conditions make a better skier. This entire camp was a progression. Therefore, we were still working toward a stable upper body and we started each day with the same pattern of drills as the block before. The warm up drills helped us create efficient habits in our skiing, and once we brought those into the course, our skiing improved noticeably. Les Deux Alpes had a few more busy days, but luckily this barely affected our training. Another coach, organized priority access for BSA athletes; the same level of access as the French regional teams. This meant that in the morning, we were able to skip the main queue for the first gondola, which would otherwise be a 45-minute wait. A few afternoons this week, we were very lucky to be visited by a Nemanje Ignjatovic, a world-class ski technician who had previously worked with the Finnish national ski team. He was more than able to answer our questions, and he showed us his tricks for maximizing ski preparation. The day before our off day, we hiked toward the Diable chairlift. Once again, it was quite a difficult dry-land training, but the views provided temporary distraction from our tired legs and shortness of breath. The following off day, we once again split into two groups. My group drove to see the medieval town of Briancon, and the long established military fort, built in 1709. The other group stayed in town to go swimming and to go down the luge. The final training block that I participated in was another four days of slalom. During this session, those of us who are going down to race slalom in South Africa began to shift into race mode. Often, the training camps I have attended have one or two days of free skiing then the second we go into gates, everyone focuses on skiing fast, and the thought of skiing technically well goes out the window. This makes the course seem much harder. However, since we had already run gates while doing drills, skiing the correct line and focusing on our technique, there was a much more solid foundation for focusing on speed. We had one foggy day out of the four, but the lifts stayed open so we were able to train through it. On the final day off we played paintball. This was my first time ever playing so I was a little nervous. This was not helped when a group of 20 Italian boys showed up. They were also on a ski camp. We ended up mixing with their group and playing against other BSA members as well. It was far more fun than I expected. Ultimately, it was a giant game of capture-the-flag in a forest area. Each team had a fort and structures to hide behind. Paintball with two ski teams obviously became quite competitive and some of us may have left with a few bruises, but everyone was all right.